LAS VEGAS—Welcome to The Living Room of the Future. Your kitchen table is a giant widget display! Your vanity mirror can also show you the latest issue of Vanity Fair! And the ceiling? Well, you can program it to look like the actual sky outside. 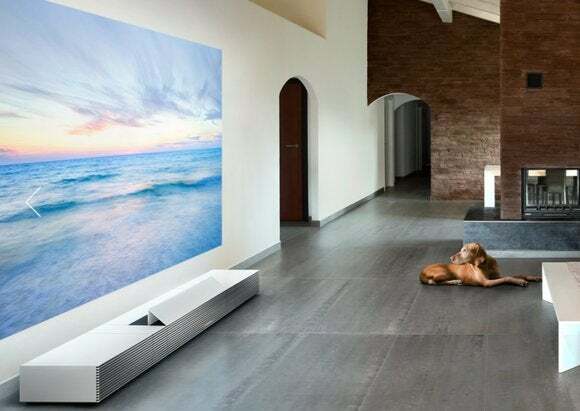 This dreamy living room concept uses projectors, displays, sensors, lights, and speakers. It all starts with the kitchen table. A projector embedded in the room’s overhead kitchen lamp displayed widgets onto the table below. In theory, you could check your calendar, leave a virtual sticky note for your roommate, read the newspaper, or browse through photos directly from this projector. Each widget was touch-friendly, as the host used drag and drop gestures to move content around the table. The Ultra Short Throw Projector's components piece together to look like a modern piece of home accent furniture. Together, these designs can create a fully themed experience throughout the whole living room. We were taken on a deep-sea expedition, with the sun beaming down through the ocean’s surface from above and fish swimming all around, paired with ambient light and music. Sony also showed off a sunset theme and an evening in Paris theme. Sure, the Life Space UX is a little gimmicky— I don’t know when I’d ever want to make my house look like the inside of a fish tank—but it’s fun to get a glimpse of what it would be like to live in Tony Stark’s house, even if it’s just for a few minutes.